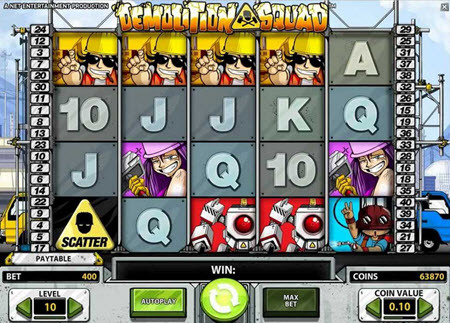 Demolition Squad is a NetEnt slot inspired by manga and anime. When wild symbols work together in this game, they can form an extra powerful wild known as the Demolition Wild. This wild can not just substitute for any regular symbol, but will also substitute for the scatter symbol to help you get a scatter win. There is a generous free spins mode consisting of up to 50 free spins and where you can get help from a 3x win multiplier. The variance is low and the RTP is a nice 97.1%. 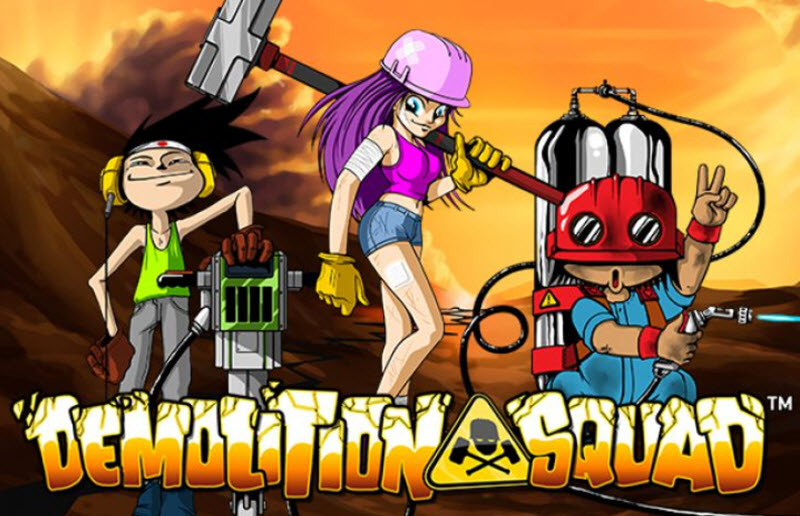 The theme for Demolition Squad is a crew of workers involved in demolishing buildings. The crew members appear as symbols on the reels: Axe, Dozer, Torch, Sledgehammer, Jackhammer, and Demolition Robot. The graphic style is inspired by anime and manga. You can adjust the coin value, select how many of the paylines to activate (1-40) and decide how many coins to bet per active payline (1-10 coins). The regular wild symbol is marked with yellow-black tape and features the word WILD. It can only appear on the second, third and fourth reel, never on the first or fifth reel. It can substitute for any of the regular symbols, but not for the special symbols (the demolition wild and the scatter symbol). If a symbol is sandwiched by regular wilds – horizontally, vertically or diagonally – it is transformed into a Demoliton Wild. A Demolition Wild on the third reel can make an additional symbol turn into a Demolition Wild. The sign telling everyone to wear a hardhat is a scatter symbol in Demolition Squad. If you get three scatters, anywhere on the reels, you get free spins. During free spins, you may get help from a 3x win multiplier. It is possible to get new free spins during free spins.